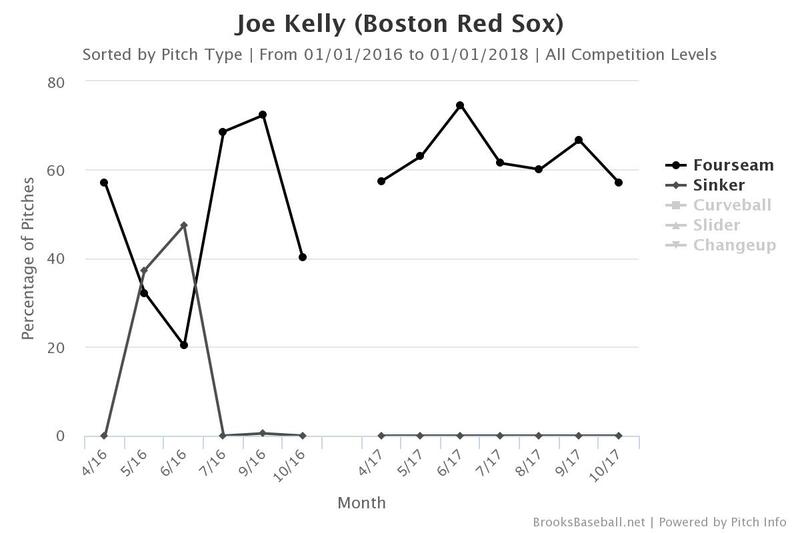 Joe Kelly was an extremely average pitcher last season. That’s all you need to know about him, because he was also an okay pitcher the year before, and has presumably settled into the player he’s going to be for his career, so I’m telling you that it’s not an exaggeration – he really is that average. Examine Kelly’s fastballs over the last two seasons and you’ll clearly see how much he’s abandoned his sinker. Even in above-average seasons, his sinker was never that useful a pitch, so abandoning it was probably in the best interests of the team and Kelly. And the fans. And everyone. 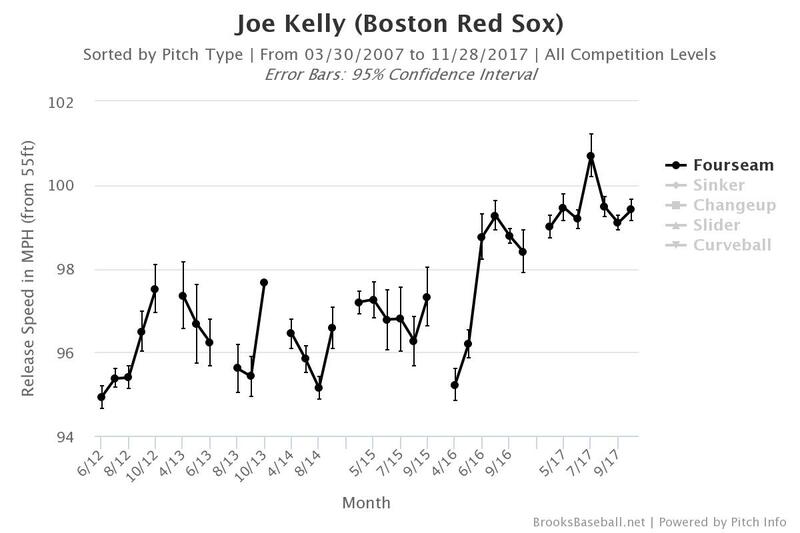 Up until recently, it always seemed like improved numbers were going to follow Kelly’s improved velocity. 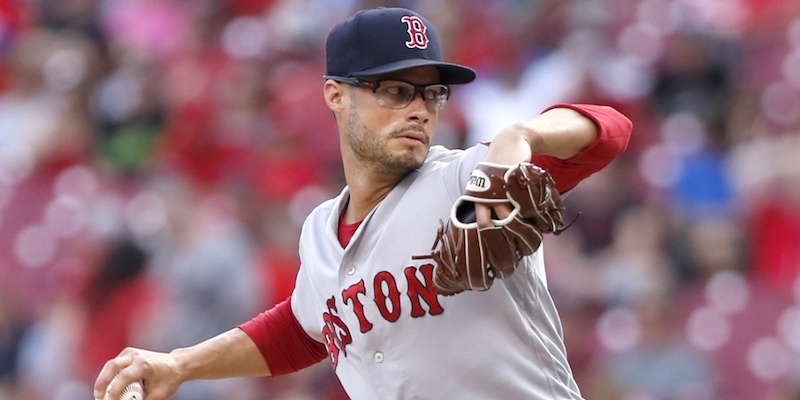 Throwing forcefully while being mostly ineffective has always been Joe Kelly’s game, so watching him rear back and throw some fire doesn’t exactly bring the same excitement as it does with other guys in the triple-digits club. Strikeouts! Or lack of them, more specifically. Kelly continues to baffle people by throwing 103 miles per hour and not being able to strike a single person out. He threw 58 innings this year and finished with a just-barely-average strikeout rate (21.9). That number was always destined to go down from last year, however, as his uptick in strikeouts in 2016 was always more of a red herring than anything. He also continued to walk batters at a staggeringly high rate (11.3 walk rate, 4.19 BB/9). Frankly, the Red Sox already have a hard-throwing righty who struggles with control, and that’s Matt Barnes. Kelly’s going to have a hard time finding innings for himself when he projects as a back-end power arm that can’t strike people out. Carson Smith, Tyler Thornburg, and Barnes are all currently better choices for the 7th and 8th innings. Like I mentioned at the top, Kelly is what he is. At 30 years old with 600 innings under his belt, it’s hard to imagine that Kelly turns into much of anything different. Since he became a reliever, Red Sox fans have been waiting for him to settle into his role and become that reliable backend arm, and it just hasn’t happened. In fact, given that Kelly ran a .252 BABIP this year (by far the lowest of his career), it’s not inconceivable that Kelly’s numbers would regress next year. He’s a free agent at the end of next season, so Kelly’s clearly inclined to put together a career year. If he doesn’t though, it’s not hard to see the Red Sox moving on in 2019. I wonder if the Cubs would trade OF/2B Ian Happ from their alleged surplus for injured E-Rod, one year of Joe Kelly (who came from that division), and a couple of low/high A lottery tickets. Then Happ goes right in at 2B when the season starts, takes over as 4th OF when Brentz craps outs again, and does some DH to keep Hanley’s PAs down. Now that I’ve typed that sentence, I like this idea so much I’d thrown in another prospect at a position the Cubs need (oops, I’m becoming DD, flinging prospects against the wall until something sticks).